It was a cold, but sunny, day today. It seemed a good day for a drive. We drove to Chapman State Park. Chapman State Park is located near Clarendon, PA, approximately 15 miles from our house. The park is open for year round recreation. Recreational opportunities include swimming, fishing (including ice fishing), boating, camping, hiking, hunting, ice skating, cross-country skiing, snowmobiling, picnicking, and sledding. This is the Chapman Dam spillway. According to the State Parks website, Chapman Dam was constructed near the old earthen dam of the Bucher Mill Log Pond, which dates back to Bucher’s Mill that was built about 1849. Isn’t this a great-looking tree? The tree creates a natural frame through which to view Chapman Lake. Standing beyond the tree, on the lake, is one of several ice fisherman that we saw today. Do you see the building across the lake? The previous photographs were taken from that side of the lake. In addition to seeing ice fishermen on Chapman Lake, we saw activity on the sled riding hill. 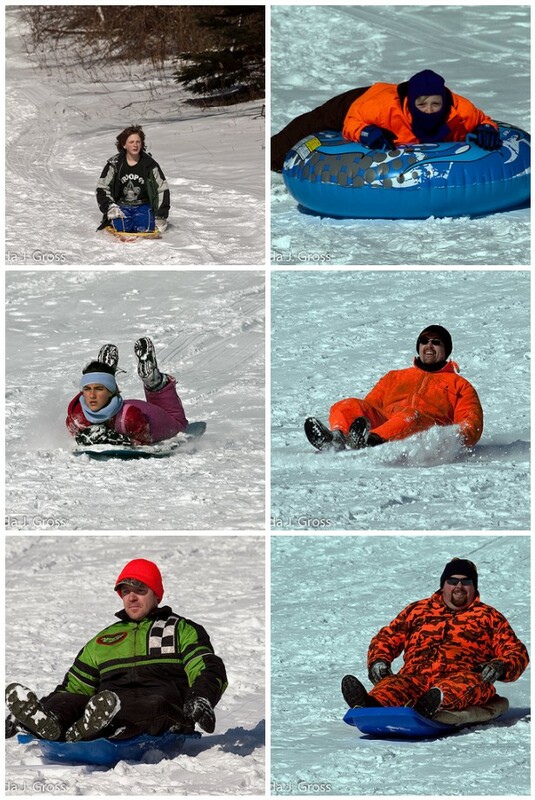 People of all ages were having a wonderful time riding down the hill on sleds, tubes and snowboards. We should go back to Chapman and retake the photo of dad, only this time I'll dress up as Jason Voorhees from Friday the Thirteenth and pretend to be sneaking across the lake to slaughter unsuspecting campers. That would be fun. You'd have to do some real fast sneaking, Stacey. Your dad wasn't too keen on standing in the shade for more than a few moments. It was too cold in the shade; he wanted to be in the sun. That looks like a wonderful walk Linda. I enjoyed all your photos and look forward to where you will be taking us next. Have a great weekend. I've seen that look on Bobs face once or twice myself…thank God for husbands who sigh deep and comply for the picture taking!I've never been to Chapman. Definatley going to add it to my list! Love these photos! The sky is so blue and the sun so bright but I'm sure it was cold!